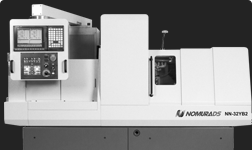 The YB2 series of machines offer a high degree of adaptability with independent slides for the main and back-spindles to increase productivity and the machining of highly complex parts. The machine configuration can easily be modified on site to accommodate production requirements. The main and sub-spindle have standard full C axis and are independently temperature controlled. A variety of options are available which include a front and back eccentric drill unit, and various combinations of turning and mill/drill units. This series provides ø32mm machining diameter, 190mm machining length, 36m/min rapid feed rate and is equipped with Mitsubishi M70V control.